Nivea Soft Refreshingly Soft Moisturising Cream with Jojoba Oil and Vitamin E 75ml. Nivea is a well-known brand, tried and trusted the world over. This light cream comes in a handy 75ml tube which can be carried in hand luggage without violating the stringent air travel regulations. 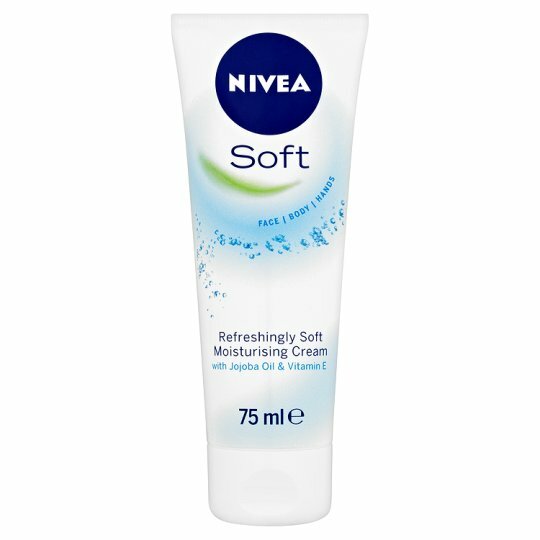 This cream, Nivea promises, is a revitalising moisturiser suitable for everyday use on the hands, body and face. The formula is light, allowing the Vitamin E and jojoba oil to be quickly absorbed into the skin where it can get to work. The cream will leave your skin soft, supple and refreshed. One of our testers, a young mum of three, was heading off to France by car and ferry. She volunteered to try out this moisturiser as she suffers from rough skin on her hands anyway – a result of constant washing up! She kept the tube in her handbag so as to have it handy when needed. They travelled by car to Dover, then ferried across, driving from port to one of the camp-grounds that are sprinkled across Europe. Even before they had arrived, our tester was delighted with the cream. She used it on her own hands initially, but when her son (aged four) complained that the wet wipes she was using him was leaving his face dry and itchy, she tried a little of the cream on him. He loved the smell and said that the itching stopped almost straight away. Thereafter, all the children insisted on having a dab of cream after using a wipe on their hands and faces! She told us the car smelled of the cream for a while, with all of them using it, but that this wasn’t a problem as the cream has a pleasant scent, neither too strong nor too flowery – a nice clean smell, her children claimed.